Yay for another 10x10 challenge! I've lost track of how many of these I've done but its been quite a few! I'm excited that this winter challenge is kicking off in January. It's a great way to jumpstart your creativity and change your perspective when it comes to your clothes. 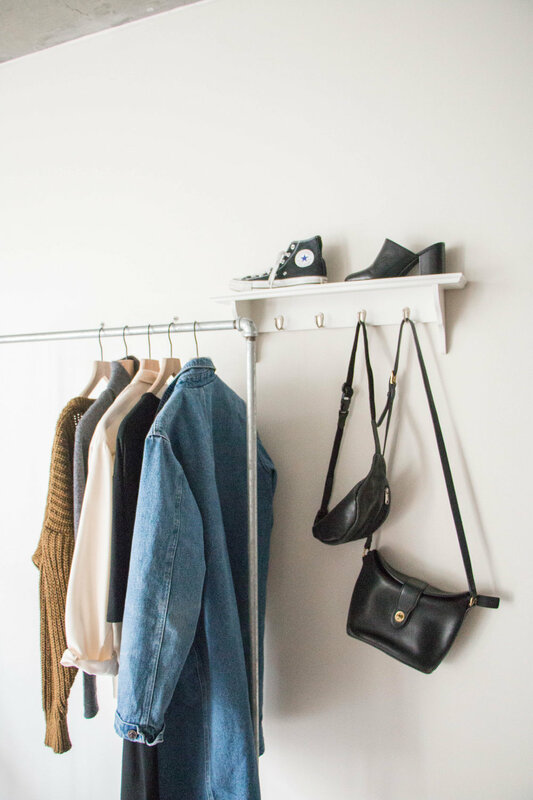 One of my intentions is to shop even less this year than the past and this challenge is a great reminder of the awesome pieces I've been able to curate in my closet. I'm also happy that this is kicking off in January because while this month can feel very invigorating it can also leave you feeling a little sluggish and uninspired. After coming off of a high from the holidays, my brain tends to slip into a slump more often than usual. I think playing a little dress up and not having to focus on what I'm going to wear for 10 days is a beautiful refresher that will leave me feeling recharged and ready to go! 3. Wear those 10 outfits for 10 days! I normally create goals for myself when I do these challenges but this go around I also wanted to use it as a capsule check and see which pieces stick out in my mind as favorites & which ones “need some love”. I'd like to have a mix of favorites and not so used pieces in my 10x10 to challenge my brain even more and give some life to pieces that are a little neglected. So to kick off this winter 10x10 (or 11x10) I'll be sharing my plan for sharing my looks, what weather and activities I can expect in the next two weeks, my 11 items including my favorites and so-sos and finally my goals. So lets get started! There are so many ways to start this challenge and any way you do it is totally fine! Some wear the outfits for 10 days straight while others will wear the outfits for two work weeks and take the weekends off. I’m going to be doing the later approach and will be wearing my outfits Monday-Friday starting 1/22 and I’ll share two of my looks at a time on the blog starting Tuesday-Thursday then repeating the following week with a wrap-up post on 2/1! I took a look at the weather ahead and to no surprise it calls for rain. The temperatures will be in the high 30s to high 40s which feels pretty typical this time of year. I have no crazy plans in the next couple weeks. I work from home & usually in pj's most of the time but I'm excited to try "dressing for work" to see if that helps improve my productivity. I've heard that it helps to actually get dressed when you work from home so I'm going to put that theory to the test! I'll also probably have some dinner dates and errand running in the mix but nothing too out of the ordinary. This is a winter basic in my closet and was the first item to claim a spot in my 10 picks. It's just so soft and cozy. It also makes for a great base layer when you need a little extra warmth. Winter white! I thought these would be fun to play around with this winter. I'm going to treat these pants like a vibrant accent in my 10x10 and hopefully come up with some fun new looks. I just adore the color of this sweater and wanted to add it to my 10x10 to break up the cold neutrals that were starting to dominate my 10 pieces. I think the contrast will make for some beautiful looks. A last minute addition to my capsule that didn't arrive quite in time. As you know I've been loving sneaks lately and thought that a black converse would be a great addition. They're also super comfortable and great for long walks. I've been loving playing with this dress as a long layer with winter and I'm looking forward to finding more outfit combinations with it. It is such an easy to wear piece and is insanely cozy. I feel like cozy is my word of the month. I feel like I'm always looking for something warm and comforting to add to my looks. I guess it makes sense because it is winter after all! I haven't been wearing these pants much as of late but they got a ton of wear in my fall capsule. As I was deciding on my 10 pieces I quickly tried them on with my black high tops and instantly fell in love with the combo. So into the 10 they go! This is another item that I wanted to add to give some warmth to my picks. It also looks so beautiful with the grey, black, cream, denim palette that I have going on. I get compliments on this coat all of the time. Even when it's paired with yoga pants and a hoodie! It's a very cool statement piece. I haven't been wearing much denim as of late so I'm excited to play around with this bold denim piece. My go to dressy shoe for the past couple of months. Since I'm wanting to incorporate more feminine or dressier pieces back into my wardrobe a heeled shoe seemed like a good idea. Though I'm slightly breaking the rules because these are suuuuper comfortable. Heart eyes all day every day. Of course these lovelies had to be in my 10 picks. I also think the flow of these pants will be a lovely contrast to the other pieces in my 10x10. I have been wearing my black high top converse a ton lately. I purchased them second hand and they've already fully established themselves as a core component in the shoe section of my closest. Another favorite lately are my florence pants. Who knew they'd be such a hit this winter! The items that have been needing a little more love in my closet are the cream silk blouse & denim duster. This denim duster is usually thrown on when I run to do errands but I haven't spent much time styling it. I've also been wearing more sweaters than blouses lately but I love this blouse so I'm hoping this challenge will help me build up my creativity. I like to have a few goals in mind when doing these challenges to help me get some tangible learnings out of them. These goals are similar to some of my past challenges but since my style is always evolving I feel that they're still applicable. Are you participating in the #winter10x10? If you are be sure to use the hashtags #10x10friends #stylebee10x10 & #unfancyremix so we can all follow along! I'm so excited to see what outfits you create!